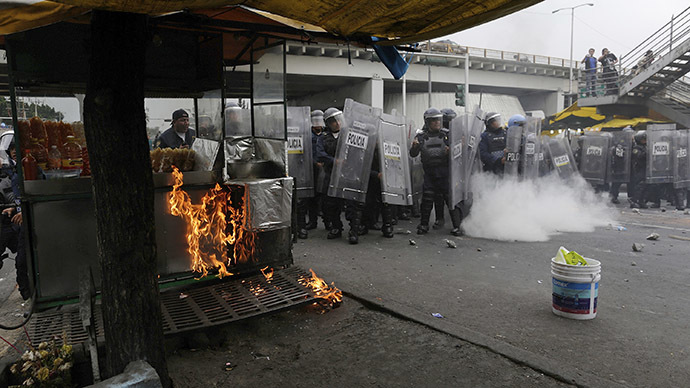 Thousands have again rallied in Mexico over a string of shocking gang-related crimes, culminating in demands for the president’s resignation. Enrique Pena Nieto’s promises of anti-corruption reform failed to stop his ratings from plummeting. The public is most distraught over a security situation that is in tatters, coupled with a police force that appears to be almost entirely in the hands of fierce drug cartels. One of them is responsible for the kidnapping and alleged murder of 43 student teachers in Guerrero state, becoming the springboard for the protests. The trail went all the way up to Mayor Jose Luis Abarca and his wife Maria de los Angeles Pineda. They disappeared shortly after warrants for their arrest were issued, allegedly for playing a direct role in the disappearance. Mexico City on Monday saw a march of thousands denouncing the president’s handling of the investigation into the disappearances and the subsequent multiple discoveries of mass graves belonging to victims of similar crimes. Protesters chanted for Nieto to resign, waving blackened Mexican flags and shouting “you are not alone” in support of the missing students’ parents, who also marched on Monday. There was a flash of nighttime violence, but the rallies were peaceful for the most part. “We no longer recognize Enrique Pena Nieto as president of Mexico because he has not met our central demand, which is to present our sons alive,” Felipe de la Cruz, spokesperson for the missing students’ families, told reporters. “Pena Nieto isn’t the leader of the Mexican people. He doesn’t represent our country. He is only contributing to an established global order, which is capitalist and market-orientated,” protester Marcella Reyes told AFP. “I think that Enrique Pena Nieto was fraudulent since the day he ran for president. 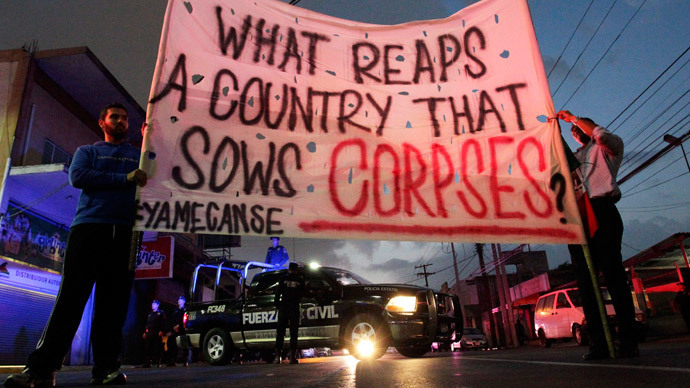 He is a corrupted man, he has a lot of antecedents, and we can’t let Mexicans have this type of person in the government,” fellow protester Dolores Yara said. Teachers and students were also seen protesting in neighboring Oaxaca state, where 1,500 of them blockaded the local airport for four hours, causing two flights to be canceled. 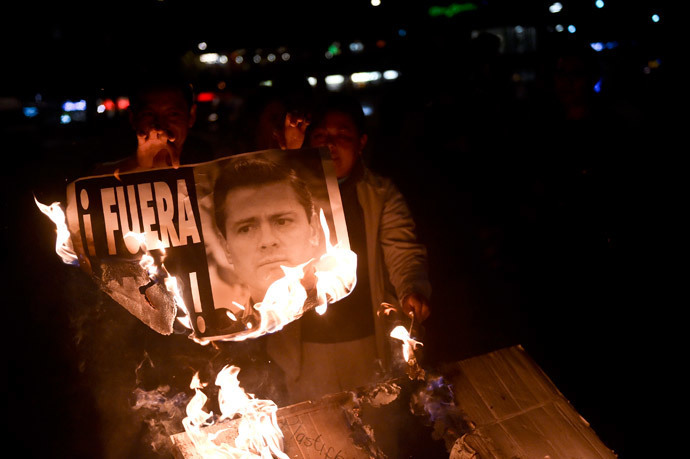 Two years after he took office, Pena Nieto’s approval ratings are at an all-time low. A poll by the daily Reforma shows an 11-percent slump from 50 to 39 percent between August and November. Another poll, by the paper El Universal, saw his popularity fall from 46 to 41 percent in that period, according to Reuters. The most drastic slump in polls coincided with the student disappearance and a conflict of interest scandal involving the first lady’s purchase of real estate. 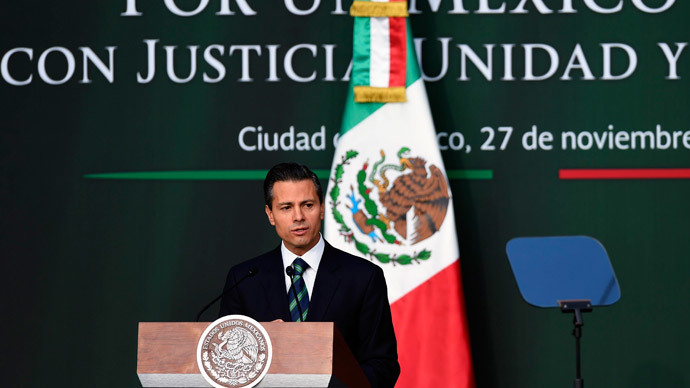 After the disappearances, Pena Nieto pledged to bring corrupt local authorities under the “rule of law.” He addressed congress with a 10-point plan on reforming local authorities, who are often ill-controlled in the country’s municipalities. It is aimed at stopping the collusion between local governments, police and gangs. The plan involves redefining powers in the penal code and adopting a special crime-battling law. He also wants to get rid of municipal police and substitute it for a federal force to fight crime in the heavily crime-infested states and towns. 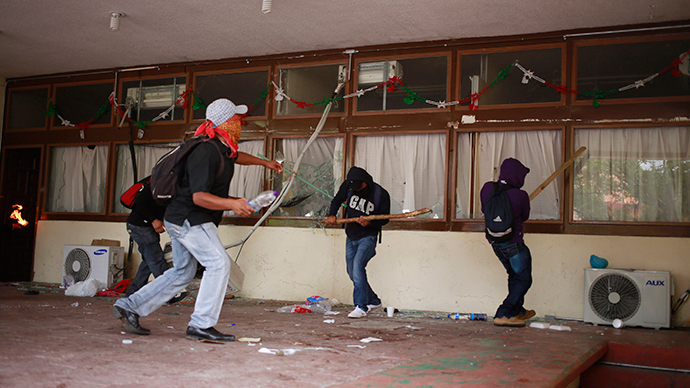 The address took place two months after the students disappeared in Iguala. "What happened in Iguala marks a before and an after," he told the crowd during a visit to the southern state of Chiapas. "It showed the institutional weakness to face organized crime, which today has more numbers, weapons and power than in the past." 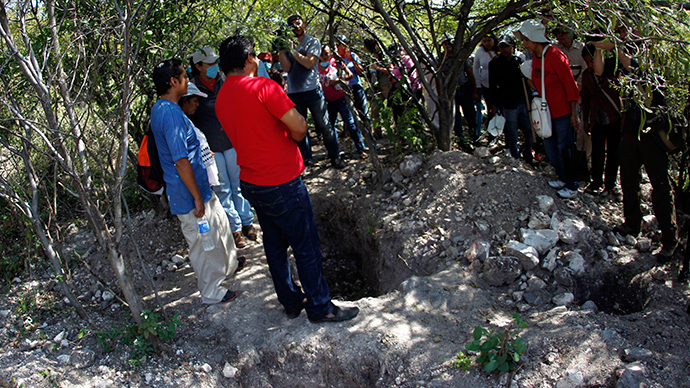 Meanwhile, up to 10 new mass graves were reportedly unearthed on Sunday, as the search for the 43 students continues. Federal prosecutors have still not declared the missing students dead, saying that more DNA testing on the recently found charred remains need to come back. They have been sent to an Austrian university for examination.